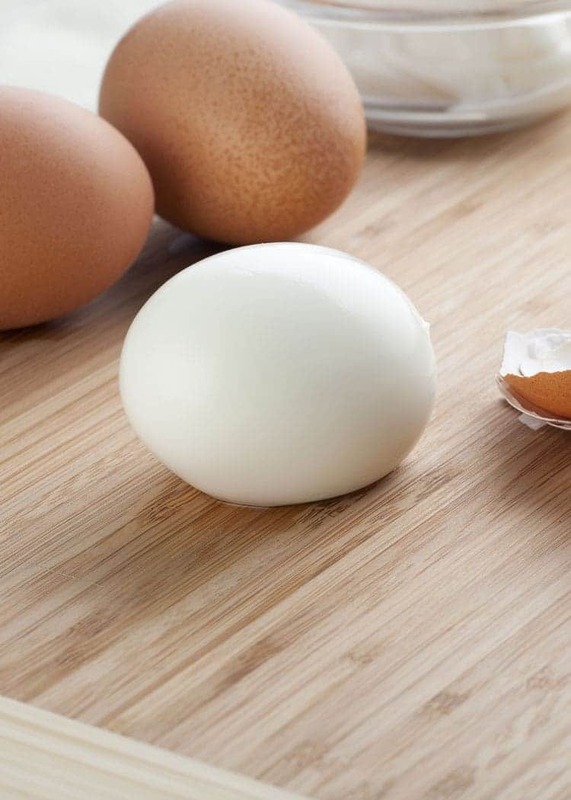 Do you struggle with how to make boiled eggs? Tell me I’m not the only one who ever had this problem? You know. How do you make boiled eggs without the shells sticking to the egg? How do you cook the perfect boiled egg so that there is an edible white oval ideal for slicing up and making deviled eggs or the most amazing Ham and Egg Salad Sandwich? Lucky for you. 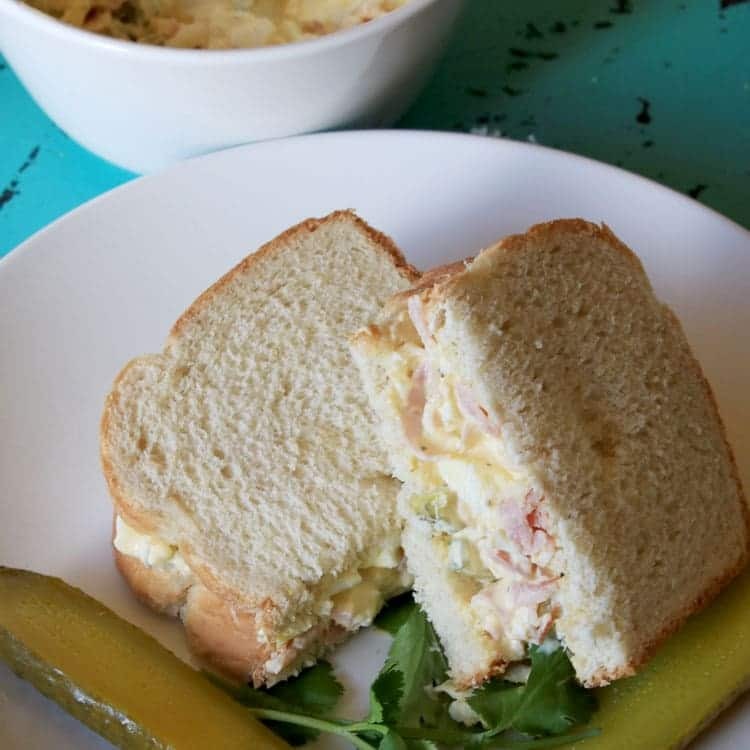 We’re going to tell you how to make the most delicious boiled eggs you’ve ever had, AND we will show you how to make our delicious Ham and Egg Salad Sandwich. Easy Peasy sandwich recipes are GREAT for busy families—like mine. Just today, I was running around (in circles, mind you, because that is how I roll) and went from planning a nice sit-down family dinner to finding out my son’s flight is delayed and he won’t get back until WAY after dinnertime. So…perfect time to make something a bit easier for dinner and save that sit-down family meal for later in the week. Making boiled eggs perfectly each and every time is easier than you think. There are several ways to make boiled eggs, and I have tried most of them. The way I recommend now is different than the way I’ve made them most of my life. Put eggs in a saucepan and cover with COLD water. Heat on the stove top using high heat and heat until water boils. As soon as the water comes to a boil, remove from heat, cover pan and let eggs sit in the pan for 12 minutes. Drain water and serve if enjoying warm eggs, otherwise cover eggs in a bowl with ice cubes and water. Let cool completely and refrigerate in not using immediately. Eggs will be very easy to peel. So, we made boiled eggs, so we have that key ingredient ready. Egg Salad is one of the easiest recipes to make, and it can be changed up according to individual tastes. There are a few things you will want to have on hand for this recipe, in addition to those lovely boiled eggs. First and foremost, when it comes to making a deli-style sandwich—don’t skimp on the bread. You’ve got to have a quality bread that embodies flavor. I love to use Pepperidge Farm Farmhouse™ Oatmeal Bread because I LOVE the flavor of it and it’s double wrapped to keep it fresh. And you’ve got to have fresh bread, right? To make the Ham and Egg Salad, start with peeled boiled eggs. Using a fork, break the eggs apart and crumble to a consistency you are happy with. Some people prefer to have the eggs all mushed up, but personally I like to see bits of white and yoke in my egg salad instead of having it all completely mixed together. Here we have eggs, Hellmann’s® Real Mayonnaise, pickles, salt, and pepper. 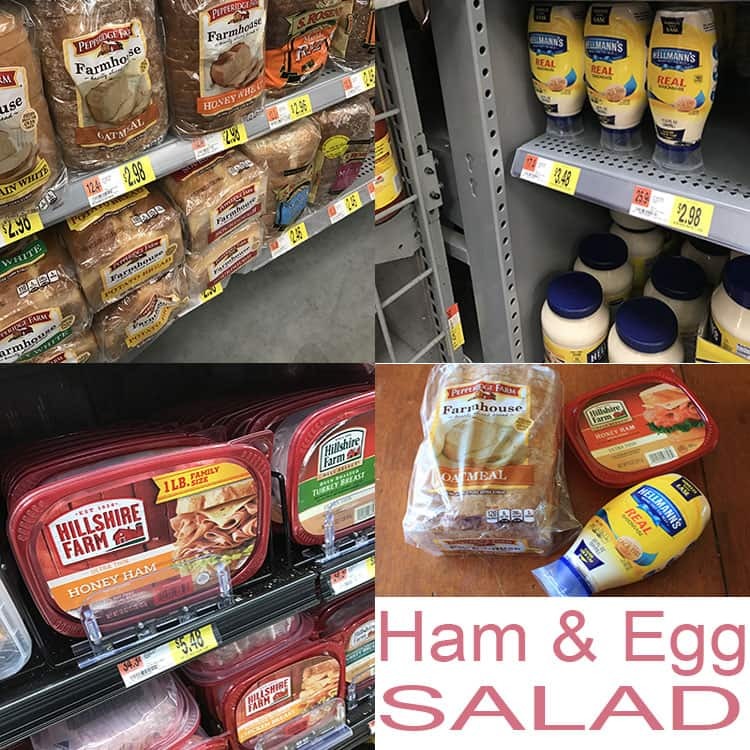 Since we are making a Ham and Egg Salad Sandwich, you’ll want to grab some lunch meat while you’re at Walmart. I picked up some Hillshire Farm® Thin Sliced Honey Ham lunch meat while I was at Walmart and can’t get enough of the flavor. It contains no artificial flavors and no by-products, which are two things I look for when buying lunch meat. 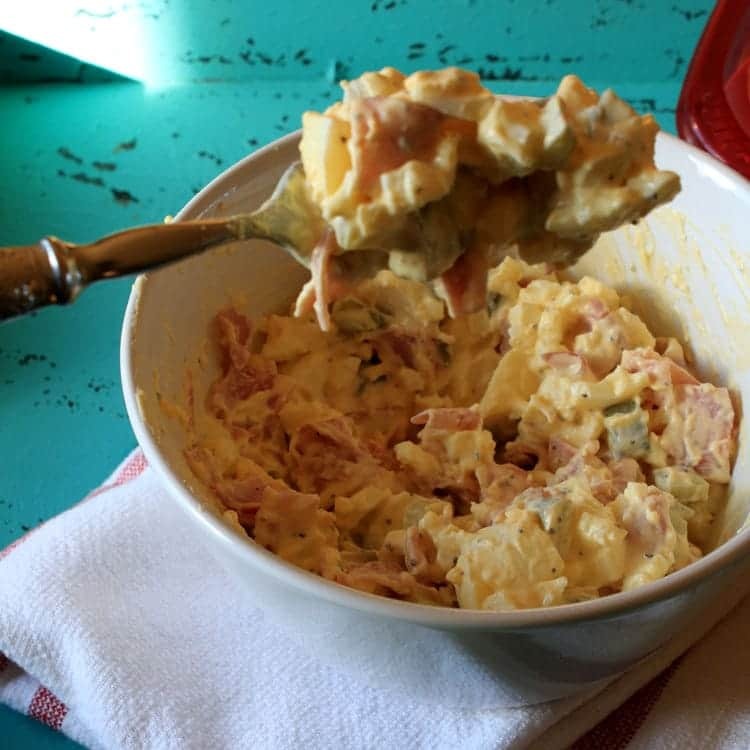 Chop up 5-6 slices of ham lunch meat, toss it into the egg salad and mix it all together. Yum! Another KEY ingredient to making the best egg salad sandwiches is Hellmann’s® Real Mayonnaise. I was thrilled to find that they have a squeezable bottle. This container is perfect for so many reasons, but in my household, our daughter has a food intolerance which makes it essential that we don’t cross-contaminate. A squeezable bottle means there is no knife or spoon going into the mayonnaise jar and no cross-contamination happening. Being worry free with our Mayo is a huge WIN for my family. 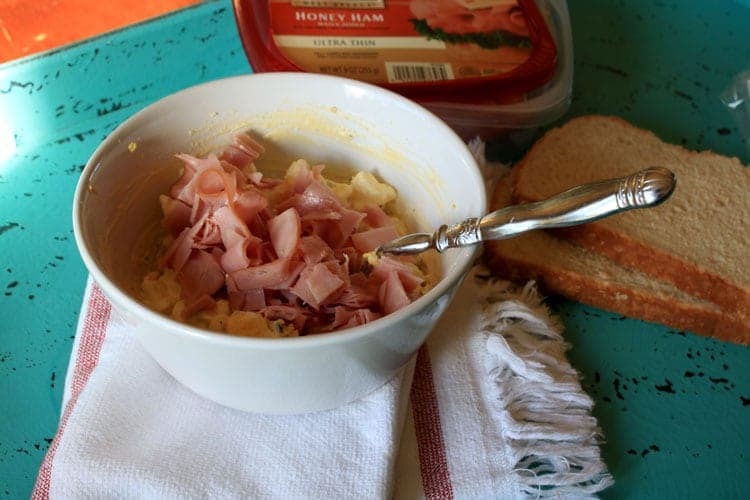 I think you’ll agree that Ham and Egg Salad Sandwiches are a great recipe solution for a busy day. Mash up boiled eggs with fork or chop them up on cutting board. 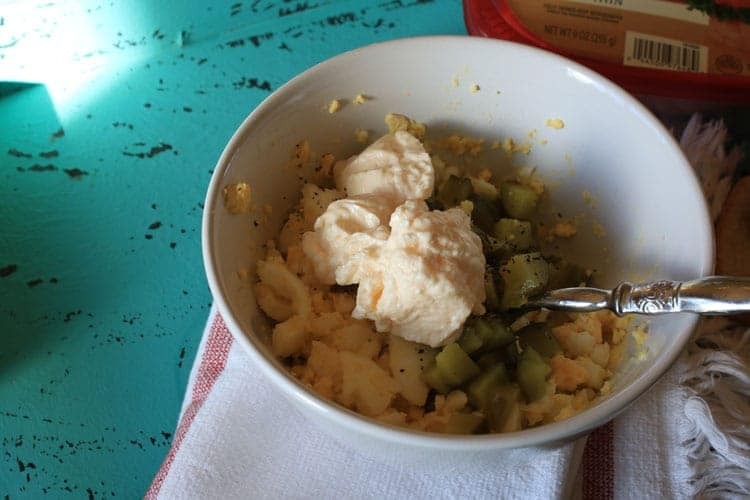 In a bowl, combine eggs, Mayonnaise, chopped pickle and chopped ham. Stir to combine. Serve on Pepperidge Farm Farmhouse™ Oatmeal Bread. Optional, add a little cilantro for some extra flavor.